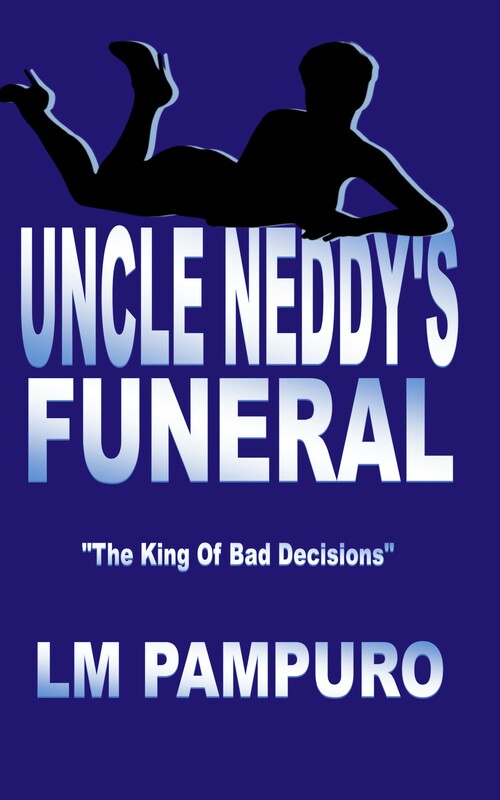 As promised, here is the first chapter, or two, of my new book Uncle Neddy’s Funeral, available now by clicking here. I hope you enjoy! Neddy took in a deep breath of air. A violent cough followed. Surrounded by darkness, he had zero perception, which, for him, was fortunate. His arms touched the silky sides, as did his legs. He tried stretching his feet to the end. It figured, where he didn’t need it or couldn’t use it, he had the space. His breath bounced back from the top. He could smell mama’s tomato sauce from breakfast. Leftover gnocchi and eggs made the perfect meal to get him through the day. With each exhale his heart skipped. About an hour ago, the air became lighter, best he could tell. The stench had to be from his exhales. He tried not to smell, breathe. Leave it to Joe and Victor to come up with a plan that involved a disgusting odor. Those two could fill a room after one of mama’s meals. Not that mama’s meals were gassy, it’s just those two needed no incentives to let one loose. Neddy’s laughter broke into a coughing fit. “Ah, minor inconvenience,” he said. In the distance, he could hear hushed voices yet couldn’t make out the conversation. The voices grew louder as Neddy assumed, people came closer. “Be careful with this one,” Victor’s brogue came through clearly. “Why boss,” another voice spoke. “Ya think he can feel anything?” Laughter filled the room. Neddy strained to hear the paused conversation. A couple of awkward coughs filled the space. “Just be careful,” Ah, Victor used his I am in charge voice. Neddy knew the tone. His crew isn’t following directions. Neddy smirked. “Think of this as precious cargo.” Footsteps followed, growing weaker by the clank. “Well he’s worried about a corpse.” Neddy smiled. He curved his temptation to knock. As funny as he thought it would be to make whoever jump at the sound, he knew better. Victor Cuzzuto would kill him. “When will the old guy retire…” Neddy banged into the side of the casket. His head bounced off the top. “Ouch!” he exclaimed as he bit into his hand. The casket stopped moving. “For crying aloud did this guy even know Neddy?” Gia hissed in her sister’s ear. The middle child of the Vaffanculo relations, Gia sat with arms folded across her satin black dress, in her opinion, a beautiful garment wasted on a funeral. Her eyes volleyed between the crowded sanctuary and the man standing at the podium. Her younger sister by a year, Amelia, stared at the priest with intent. Her eyes tearing at the mention of her favorite uncle’s name. “Giuseppe was an exceptional man: father, brother, son…” as the priest paused a moment Amelia glanced over at her ninety-year-old grandmother who sat playing with her false teeth. She nudged her sister in grandma’s direction. Grandma, dressed in traditional funeral black, included the customary laced veil, now thrown haphazardly over her head. Grandma Lena swished her teeth around her mouth, popped them through her lips, then caught the full set in her hand. Not a bit of spit followed. Without missing a beat she’d place the choppers back in to start again. “Oh, this is going to be entertaining,” Gia smirked. “Which is he referring to?” Amelia giggled. “Only those he knew about…” without missing a beat Gia responded. “…And was a wonderful son…” a “humpf” came from the direction of their grandmother. The girls watched their mother squat walk towards grandma. She knelt in front of her, rubs the old lady’s arm, as she whispered something in her ear. Grandma turned around and flicked her wrist in her daughter-in-law’s direction. The girls’ eyes grew wide. “We would get slapped,” Gia pointed out to a nodding Amelia. Their mother just shrugged stood fully erect, walked back to her seat. Her face expressionless. As the priest continued to extoll virtues her uncle never possessed, Gia looked around the crowded funeral home. Bright purple flower arrangements lined the wall then veered around the back of the casket. Family and friends sat, stood, and waited in the adjacent rooms, spilling outdoors under the canvass walkways to pay respects. She knew most of the folks around here all her life, some by reputation, most by some sort of relation. “Are you sure he’s talking about Uncle Neddy?” Amelia said. “I don’t think this one had met him. He’s new. Remember, straight off the boat from the mothership,” The priest appeared to be moving around the alter to avoid stepping in something. “Ship…Land…Tomato…Tomato… What is the difference? The guy knows nothing about our family or the person he is talking about.” Gia moved her right hand as she spoke, the same mannerism her mother and grandma used. “I think she’d rather be reading the fifth to be’s eulogy.” As both girls began to snicker Gia glanced up in to their mother’s warning glare. In silence Angela Victorio Cuzzuto Vaffanculo held up one finger. Gia nudged her sister. She gave a head nod towards their mother. Elegantly she raised a second finger. Her dark blue eyes never wavered. Both Gia and Amelia gave a slight nod, leaned back in their chairs. Legs crossed at the knees they mirrored each other’s worried glances, unconsciously tapping their bottom foot. Angela relaxed a little in her chair. To her left, her husband Joe, snored quietly. Angela poked his arm. He would jump a little, smile at her, only to close his eyes again. He held her left hand in his. Every so often she would feel a gentle squeeze. Ah, my Joseph, he works so hard at the restaurant. Still cleaning up his brother’s messes. She thought, so he’s napping. He is not disrespectful. It’s his brother’s funeral not mine. He’s better not nap at my funeral. A laugh escapes from her lips. Who am I kidding. I will bury him first. Here, a little nap hurts no one. Uhg – look at the line – I’m sure half are here because they love Neddy, the others want to make sure he’s dead. Her lips turned up into a discreet smile. Iksch – This is all good. All these people here. This will help us with our situation. I wonder how many know? She glances at her mother-in-law who now moved from playing with her teeth to eating what looks like a pignoli cookie. Now where did those cookies come from? Crumbs float down the old lady’s face. Angela nudged a tissue into Enzo’s hand. She pointed towards the older lady. “Oh, for crying aloud,” he proceeded to float down the row to the matriarch’s side, causing as little commotion as possible. “Mrs. V, you need to stop with the cookies,” he reprimanded in a hushed voice the people in the back of the room could hear. “The stunad caused me so much stress I aged five years.” Enzo bit the inside of his cheek yet the grin across his face gave him away. “What’s disrespectful is having this idiota talk about someone her never met!” As the word idiota came out of the old lady’s lips, all those in close vicinity did the sign of the cross. The gesture continued down the rows like the wave at a football game.